As individuals living with AIDS, caregivers, and loved ones struggle to make sense of such an undiscriminating disease, support and comfort becomes one of their greatest allies. Filled with the hope and warmth that nature delivers, the AIDS Memorial Grove settled in the Golden Gate Park serves as a dedication to all the victims of the illness and aims to ease the pain left behind for supporters, husbands, wives, children, and best friends. With this inspirational plot of trees, flowers, rocks, memorials, meadows, and additional overwhelming scenes of natural beauty, visitors come to seek strength, share stories, and create memories that heal. a) Main Entrance: As you approach the primary entrance to the Grove, you will come across the signature boulder at the Main Portal. Weighing seven tons, the Sierra granite specimen was inscribed and situated at this location to pay homage to the World AIDS Day observance, which took place on December 1, 1995. Upon entering the Grove, the Woodland Path is not far, where a wheelchair accessible ramp leads to the eastern sights of the grounds. This particular area offers the sights of pine trees, Monterey Cypresses, redwoods, and Monterey Pines. Not too far from the entrance, you will also find your way to Dogwood Crescent, where the Circle of Friends resides. It is at this sight where an array of names is engraved into the floor of flagstone. More than 1,500 people are represented at the Circle of Friends, which continues to grow with new entries during the autumn season. Here, visitors come to place flowers and become inspired. c) North Slope (Pine Crescent): As you step foot on the set of stairs leading to Pine Crescent, you probably didn’t know that they are comprised of old San Francisco relics donated by the city. Made from old street curbs, this site serves as a gathering quarter. The North Slope showcases the regal presence of pines as the sky peeks through beyond the distance. d) West End (Fern Grotto and Meadow Overlook): A winding staircase flanked by inviting shrubbery presents a calm stroll to the Meadow, where a variety of attractions can be found. At Dry Creek, volunteers spent a great amount of care and time renovating the surroundings, including the placement of a handful of benches along the creek bed. Surrounded by plants and trees, taking a rest on a bench provides the perfect chance to reflect and enjoy the shade. Throughout the Grove, there are numerous circular features. It is through this representation that visitors are reminded of the power of an embrace. At the Fern Grotto, it is the Circle of Peace that waits. A poem by Thomas Gunn is inscribed, dedicated to all of the unidentified individuals who fell victim to AIDS. The West Portal is also in this area, which sees a fair share of entrances from visitors coming in from the western end of the Grove. e) South Slope: With society garlic whispering over your shoulder, a bench at the base of South Slope welcomes tired legs. A variety of maples and other deciduous tree specimens and plantings are positioned within this part of the Grove. The South Portal offers one of three designated entrance points. Before the Grove became known as an AIDS memorial, it was called de Levega Dell. In the South Slope area, a dark rock emerges into view with the original name of the grounds etched on. f) The Meadow and Crossroads Circle: Healing circles take place throughout the Grove, where the Meadow offers the perfect setting for such a moving moment. With vibrant shades of green decorating this section of the park, the brilliant power of the sun sneaks past the towering treetops to present an inviting open space. At Crosswords Circle, which is situated at the western edge of the Meadow, a tribute is paid to the women and children affected by the AIDS virus. a) Picnic: Grab your blanket, picnic basket, and gather an assortment of food because many visitors come to the Grove to hold intimate picnics and family get-togethers. With tons of shade and open meadows, you are sure to find a comfortable spot all to yourself. b) Get Married: The Grove provides the perfect setting for an assortment of life events and rites of passage fit for their magnitude. It is not uncommon to see weddings, commitment ceremonies, and other family celebrations of life throughout the gardens. c) Hold Performing Arts Events: What better place to enjoy the uplifting power of song, dance, and music, as a wide-range of performers take to the grassy meadows or designated gathering areas at the Grove? Poetry and other spiritual assemblies are also popular here. a) Food: Both homemade and catered food is allowed at the Grove, although barbequing is not allowed, whereas other areas of Golden Gate Park are more suited for this activity. b) Drink: All types of beverages are allowed at the Grove, even alcohol, which is permitted at the park unless drinking gets out of hand or involves an underage participant. c) Sound and Music: If you plan on amplifying music or other sound equipment, you should be respectful of others and keep it to a reasonable level. d) Candles and Fire: Unless you have been granted permission before entering the park, candles and fire are not allowed. During the late 1980s, reeling from the grief that came as a result from dealing with the effects of AIDS, a small collection of San Francisco residents decided to act upon their loss. They imagined a calming natural scene where memorial services and private refection could take place. Drawing from a blueprint of heartache, a host of landscapers, architects, designers, and volunteers pooled their energy together to produce a tribute filled with life that would pay homage to love, friendship, healing, and existence. 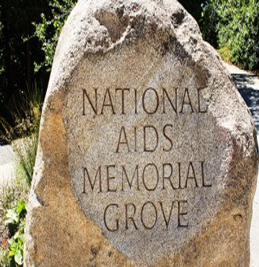 In 1996, Congress and the President of the United States approved the “National AIDS Memorial Grove Act”, which officially set aside the notable deLaveaga Dell in Golden Gate Park as the home for the first AIDS memorial to grace the nation. The landscape produced a public dedication to the lives that have been affected by the AIDS virus. Fed by community support and outreach groups, the Grove continues to flourish, including monthly workdays held on every third Saturday during the months of March through October. Through the generosity of volunteers, who tend to the continuous care and maintenance of the Grove, private funding also helps keep the grounds alive. Overall, the Grove serves as an important sanctuary for all to enjoy. Location: The National AIDS Memorial can be found on 856 Stanyan Street, which is part of the Golden Gate Park. For more information about volunteer opportunities and programs, click here.